Hosting a clambake is a great idea for a seasonal gathering. You can host a day cookout and have a clambake, or host an evening gathering and serve dinner. Clambakes are Summer and Autumn favorites here in New England. 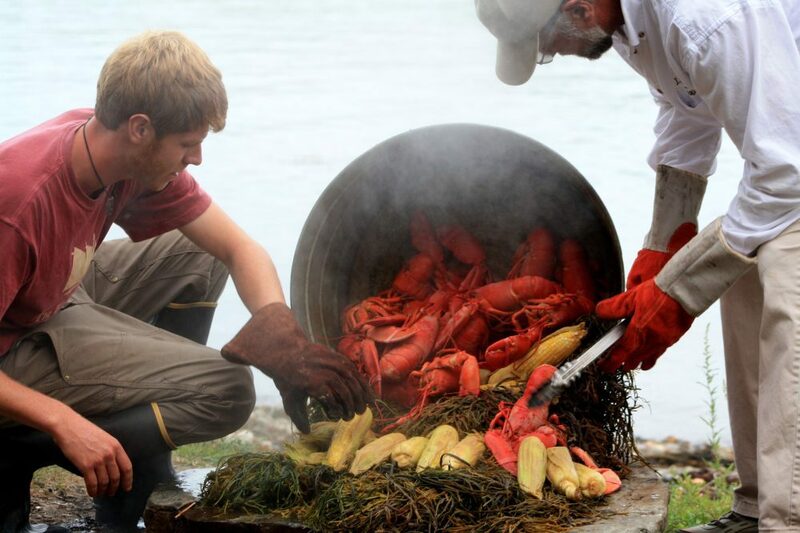 With the fresh, native species available to us, we can curate the best clambake with only the best ingredients. Throughout this blog, we’ll explore all the details of planning, preparation, and cooking, so you can host your own. Planning for a clambake requires you to find your space on the beach or in the sand. A classic clambake starts with a 4ft by 4ft hole dug in the sand. If you’re not at home or on a private beach in the sand, make sure the local beach you choose allows for recreational activities such as cooking and starting fires. The clambake should take about 4 hours to cook, so plan ahead to give yourself enough time. Clean all ingredients for preparation, and try to get as much sand out of the shellfish as possible. Obviously, it’s shellfish and will be a little crunchy by nature, but do the best you can to avoid a surprising mouthful of sand hidden in the shell of a mussel. Once you dig your clambake hole in the sand, you’ll want to fill the bottom with stones for cooking. Prepare by warming them up. You will need about 15 lbs of seaweed to help you cook your clambake. Rockweed or bladderwrack work well as they can withstand high heats, and are abundant in New England. When the rocks are hot, you can start bagging your ingredients in mesh bags. Then start layering your seaweed. Remove ash and debris from the top of the stones first, then place your seaweed, food, seaweed, and food etc. in that order. Be sure you have enough food for everyone at your clambake before you begin the baking process. When you decide on your ingredients, clean everything well before wrapping each group in the mesh bags for cooking. 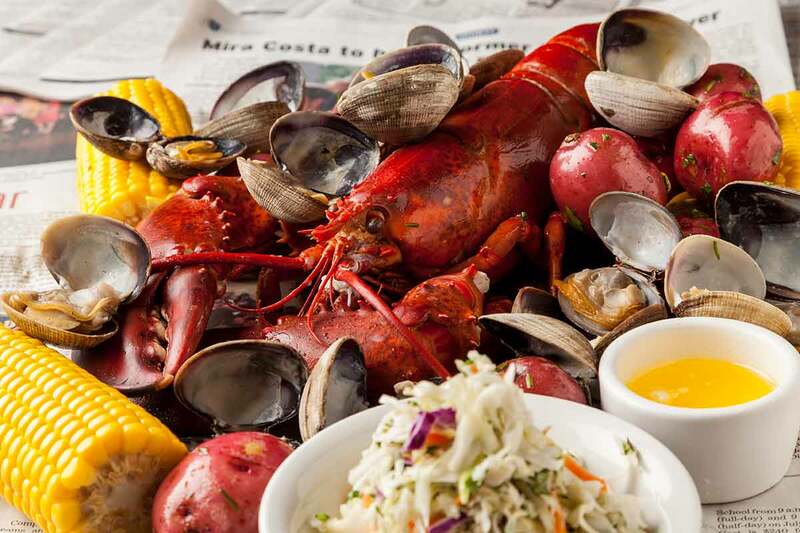 The classic ingredients for a clambake are as follows: lobster, clams, mussels, crab, sausage, and vegetables like corn and potatoes. 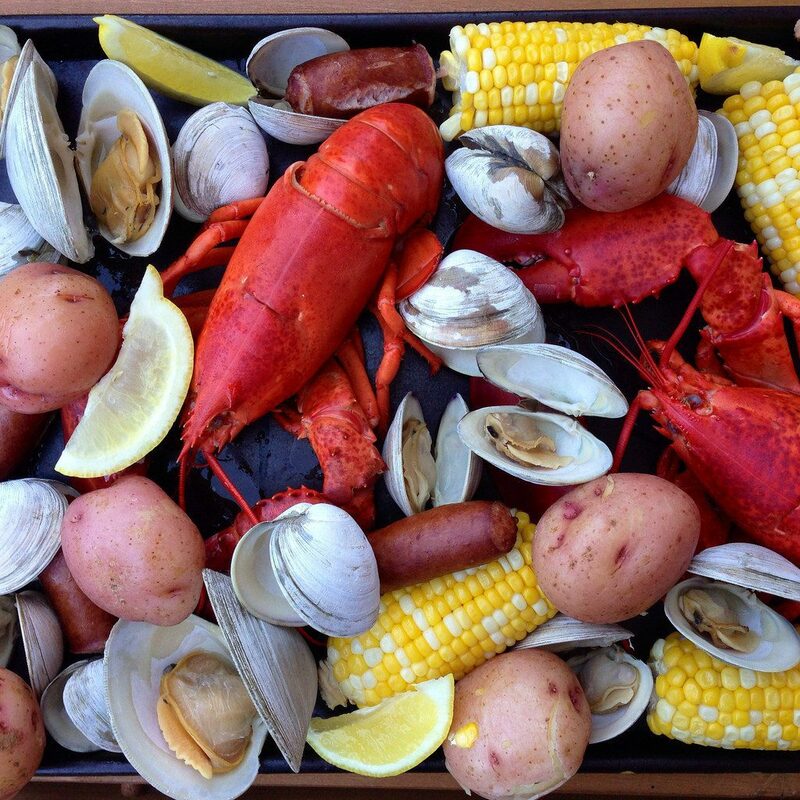 What you include in your clambake is entirely up to you, and there are no wrong choices! Be sure you pay attention to cook time, and layer your ingredients accordingly. For example, lobster takes the least time to cook so they would likely go in the middle or near the top of the pile. Choose veggies that can withstand high heats – corn and potatoes work well. Steer clear of squash or vegetables that can turn messy in high heats. Most of the ingredients cook through in the same ways at the same temps. This is helpful, and is usually why people love clambakes. They are a popular choice for gatherings, as people can watch, relax, and enjoy the cooking as a fun process. When you’re ready to serve your clambake, you’ll know by the color of the lobsters. Since they take the least time to cook, they will be bright red when they’re ready. This will let you know when your clambake has been cooked thoroughly, and better overcooked than undercooked! The clambake in total should take around 4 hours. Clambakes are great meals for almost any summer celebration. Though they’re a bit involved, they’re well worth it for the classic taste and slow cooking process. They’re also so versatile because you can choose your own ingredients pertaining to your crowd! You don’t have to stick with the classics. Just be sure to pay attention to cook time and placement, and you will be ready to dive in!